When you work from home, there is always something that can reduce your productivity; however, that is just as true for those who work in an office. It's just that they are often different things. Knowing what keeps you from being productive is the first step to learning how to keep yourself on task. Here are the 7 areas where most of us can use some improvement and what you can do to boost your productivity. Of course, no one can ever completely eliminate distractions—either in an office or at home. But you can reduce them by knowing what distracts you and taking action to avoid it. In an office, it might be getting pulled into unnecessary meetings or chatty co-workers—things not necessarily in our control. At home, you may have more control over distractions—family members or tasks around the house. Recognizing what pulls you off task is the first step to reducing distractions. Once you know what distracts you, make a plan to avoid those distractions. This could mean having appropriate child care, closing your office door, using a strict schedule to complete tasks before allowing yourself to move to something else, not allowing yourself to use social media or personal email during work hours, etc. Multitasking gets a bad rap, but in reality, everyone does it to one degree or another. So, learning to multitask effectively is important. Some things need your full attention, and some do not. When you work at home, though, you have to be extra vigilant in knowing which is which. Otherwise, you can find yourself always working or never really finishing anything. 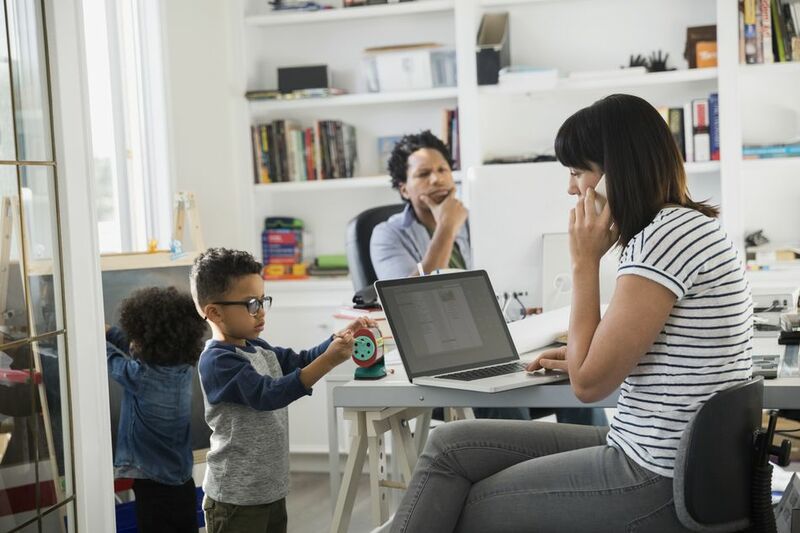 Too much multitasking when you have children in the home can make them feel that you never give them your full attention, and this can lead to behavioral problems. Set yourself up to succeed at home with work-at-home ground rules for both yourself (perhaps in regard to multitasking, when you work, etc.) and for everyone else in the household. Children especially need clear boundaries for behavior while you are working. However, your partner or other adults in your life may need them as well. This might include your co-workers who may believe that because you work at home you are available 24/7. Clear expectations for what you can and can't do when you are working, when you will work and what you expect from those around you will help all from being disappointed. You can't be everything to everyone—as is so often expected of those who work from home. Let your physical space help you boost your productivity. If you need to avoid distractions and multitask appropriately, then be sure your home office helps you with that by reducing temptations. A space with a door that can be closed signals to others when you do not wish to be disturbed. If that space means you are in a bedroom or den where other distractions may tempt you from work, that can be a problem. Unfortunately, we do not all have extra rooms that can be used exclusively as a home office so figuring out your priorities, weaknesses, and strengths is the key to creating a space that works for you. When you work outside the home, leaving the office is often a clear signal that your work day has ended. When you work at home, the signal isn't always quite as clear. When home and work are in the same place, it is especially important to ​manage your time well by setting your specific work hours. Perhaps you can set an ongoing regular schedule, or maybe you need to take a look at the calendar each week and determine when you will work. You won't always be able to stick to this, but the act of making a plan sets a framework that can keep work from creeping into your personal time. This goes back to those ground rules you set because it also gives your family an idea of when you are available and when you are not. Whether you are in a telecommuting position or you have your own consulting or home business, all remote workers need to network to stay visible to the people they work with—clients, coworkers, and others in their professions. Telecommuters may find that their colleagues forget to inform them of meetings or, worse yet, that they are overlooked for a promotion because they are not physically present. Isolation from your workplace can lead to missed opportunities. However, isolation can be avoided.by taking an active role in your workplace. If you can go into the office sometimes, do that. While you are there nurture relationships with co-workers and superiors. Get out and meet clients face to face. If this isn't practical, use teleconferencing tools to be virtually present. Make an extra effort to touch base with and exchange information with colleagues so that you keep up with trends in your industry. Distractions reduce what we can accomplish. Multitasking can feel like we are pulled in many directions. Lack of ground rules can mean unrealistic expectations that disappoint family members and colleagues. Being overlooked and forgotten at work is always frustrating. So working on the first 6 of these potential problems can help you manage stress when you work at home, but they aren't enough alone. Use these 10 tips for managing stress, which all focus on self-care.